While the results had appeared evident for several hours, when the scales were closed at the 2001 Southern Kingfish Association National Championship, it became official that the Carolina Adventure Fishing Team had topped the 299 boat field. The skies over Ft. Pierce, Florida were shining brightly as Captain Jerry Dilsaver sprayed the tournament officials, spectators, his crew, and himself with a toast of champagne. Photo by Sam White courtesy of the SKA. Dilsaver, along with crew members Bob Black, Oak Island, NC, and Richard Denning, Willow Springs, NC, had come from 2nd Place in the 23 feet & Under Class and 5th position Overall, on Day 1, to take the lead early on Day 2 and never relinquish it. The Carolina Adventure crew recovered after losing a really large fish on Day 1 to bring a 34.22 pound king to the scales. Then, on Day 2, they were the second boat to weigh and brought a 40.24 pound king with them. Their 74.46 pound aggregate weight would hold off all challenges as the tournament concluded. Tom Kenney, Ft. Pierce, Fl., led the Offshore Warrior to a 66 pound aggregate and claimed the win in the 24 Feet & Over Class. Yes, it was a case of revenge of the little boats, as Dilsaver and crew posted the heaviest weight of the tournament while claiming the 23 Feet & Under Class title. Mike Landreth, Scott Parrish, and Brent Gaskins, all of the Garner area, corralled 2nd Place in the 23 Feet & Under Class on the Hit-N-Run. Carolina Adventure and Hit-N-Run are both KenCraft 235 Tournament Edition Center Consoles and, in a unique twist, were sharing a house during the tournament. The trail to the National Championship began in January 2001, when over 1,000 boats began attempting to qualify in 1 of 14 Regional Divisions. Invitations were sent to 350 boats and 299 attended. The remnants of Hurricane/Tropical Storm Olga had pounded the Florida Coast for several days before the tournament and scattered the fish. 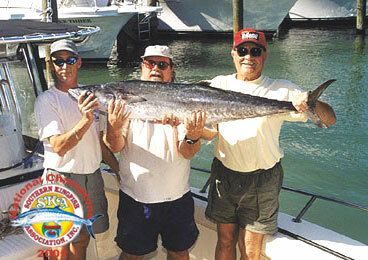 Boats were spread from Daytona to Ft. Lauderdale in search of a winning pair of kings. Carolina Adventure, Hit-N-Run, and Offshore Warrior all found their fish in the general area of the Hobe Sound Loran Tower, between St. Lucie and Jupiter Inlets. On Day 1, the Carolina Adventure lost a really large fish shortly after lunch. What made it worse was that they got a look at it before it bit the wire leader in two. Rebounding, they first caught a king of about 15 to 17 pounds and then the 34.22 pounder that they weighed. This fish hit a ribbonfish on a downrigger about 50 feet down. On Day 2, they started with a spread of ribbonfish and large mullets to try and entice another nice fish. This tactic worked well as the 40.24 pounder sampled one of the mullet, shortly after 8:00 AM. This fish was poorly hooked in its belly and nearly pulled free before Dilsaver stuck it with the gaff. The rest is history as this was the second fish weighed that day and combined with their fish from Day 1 to secure the win. For more information get a copy of the new Carolina Adventure and/or Angler Magazine and visit www.carolina-adventure.com and/or www.fishska.com.